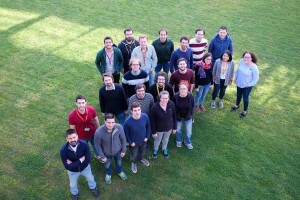 Our main research interest is on the discovery and mechanistic elucidation of new asymmetric organocatalytic and photochemical processes that address unsolved problems in synthetic methodology. The final goal is to develop environmentally respectful and innovative catalytic methods that will find widespread use in modern organic synthesis. Our research aims to identify novel reactivity concepts that could redefine the synthetic potential of venerable organic processes. Expanding upon our recent results, we are investigating further applications of photo-organocatalysis, where key transient intermediates of organocatalytic processes in the ground state actively participate in the photo-excitation of substrates, without the need for an external metal-based photosensitiser. The main objective is to combine two powerful fields of molecule activation, visible light photocatalysis and metal-free organocatalysis, to efficiently realise fundamental carbon-carbon bond-forming transformations in an environmentally respectful way. Our motivation is that the use of light excitation to bring a molecule from its ground state to an electronically excited state could open new dimensions to chemistry. i) Controlling the stereochemical outcome of catalytic photochemical reactions driven by visible light. Enantioselective catalytic variants of sunlight-driven photochemical processes hold extraordinary potential for the sustainable preparation of chiral molecules. However, the involvement of short-lived electronically excited states inherent to any photochemical pattern makes it challenging for a chiral catalyst to dictate the stereochemistry of the reaction products. Recently, we discovered (Nature Chem. 2013, 5, 750-756) that readily available chiral organic catalysts, with well-known utility in thermal asymmetric processes, can also confer a high level of stereocontrol in synthetically relevant intermolecular carbon-carbon bond-forming reactions driven by visible light. A unique mechanism of catalysis was proposed, wherein the catalyst is actively involved in both the photochemical activation of the substrates, by inducing the transient formation of chiral electron donor-acceptor (EDA) complexes, and the stereoselectivity-defining event. We believe that the photochemistry of EDA complexes, formed in the ground state upon aggregation of organic substrates, may provide intriguing opportunities to control the stereochemical outcome of catalytic photochemical reactions. ii) Photo-organocatalysis and energy transfer. Exploiting the capability of simple organic molecules to act as triplet sensitisers for conducting fundamental synthetic processes in an environmentally respectful way.